We are one of the well-known companies that present an extensive series of Cage Mill that is available in diverse specifications. Designed to break lumps & sieve detergent powder, adoptable to select suitable size of mesh to deliver acceptable particle size. We are instrumental in offering a wide range of Soap Scarring Machine to our clients. We are one of the leading organizations by providing broad range of products including Cage Mill to meet varied demands of the clients. We are engaged in offering Powder Cage Mill Machine, which is extremely praised in the market. - The machine is useful for the manufacturing process of food products, pharmaceutical products, detergent powders , pesticide powders, Industrial chemicals etc. Cage mills (sieving machine) is use for the sieving of detergent powder. Having capacity of more 500 to 1000 kg per hour. Equipped with the 5HP motor highly effective machine for the sieving of detergent powder. Cage mill is used for Mixing and grinding the Powdered Material. 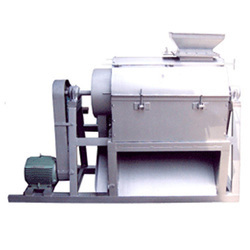 Cage mill (sieving machine) is use for the sieving of detergent powder. Having capacity of more 800kg/hour. Equipped with the 5HP motor highly effective machine for the sieving of detergent powder.